If you're looking to take your riding to the next level, our Tarmac Comp Disc is one of the fastest and most economical ways to do so. Like the S-Works Tarmac iterations, it features a Rider-First Engineered™ design that that applies specificity to every tube size and carbon layup for every frame size. This creates the optimal balance of rigidity, weight, and responsiveness, so every frame, regardless of size, performs just as we intended. You'll also find an identical, Grand-Tour-winning geometry, plus a FACT 10r carbon fibre construction that's nearly mirrors what you'll find under the likes of Peter Sagan and Alberto Contador. For the spec, we selected components that deliver the best bang for your buck, stiff, reliable Axis Elite Disc wheels, a mix of Shimano Ultegra 6800 and 105, a bevy of Body Geometry components that maximize performance by providing the utmost in comfort, and powerful hydraulic disc brakes that stop on a dime no matter the conditions. S-Works FACT full carbon fork with tapered construction provides incredible front end stiffness and steering response for instantaneous accelerations and high-speed descents. 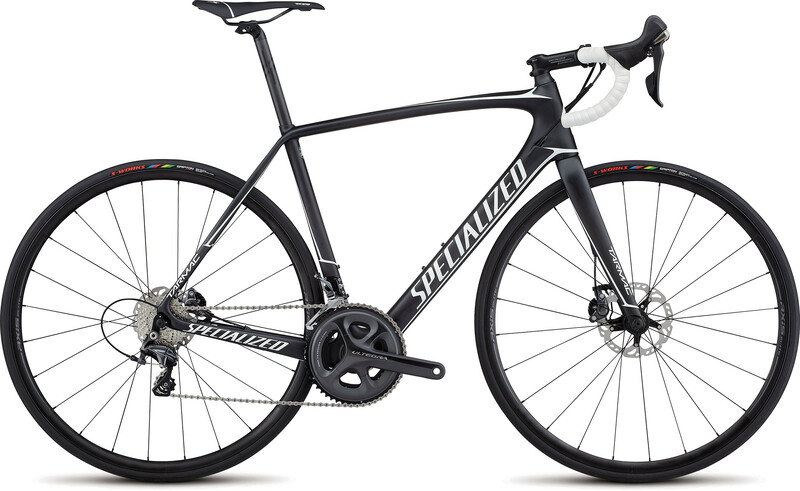 It's also designed for disc brakes, so you won't experience any lurch or degradation in performance.